Tracing boards were created as visual aids used to illustrate the meanings and principals of Freemasonry as taught within the degrees. Much of the symbolism is from the Western tradition, and has been adapted here for the modern mason. 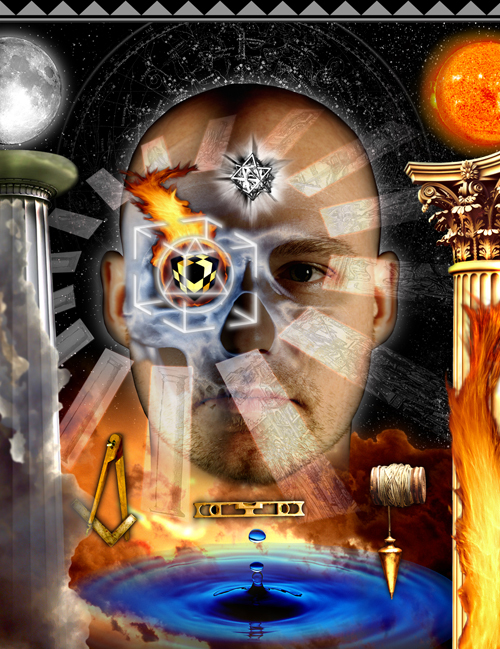 In the image there are many symbolic and esoteric interpretations. With adapting this work, the most significant change is the positional change of the viewer, moving from an external passive position looking in upon a pastoral scene to a participatory one with the viewer actively engaged in the activity. This changing position positions the initiated as if within mirror from the reflector to the reflection. This movement inward becomes the focus of the degree, passive to active moving the self towards the divine. Read a three part lecture on the deeper symbolism of the deeper meanings behind the Masonic Symbolism on the Winding Staircase. To learn more about The Fellow Craft Degree read Pike’s Fellow-Craft degree from Morals and Dogma, or the Fellow-Craft degree from Duncan’s Ritual and Monitor. Interested in owning your own Modern Second Degree Masonic Tracing Board? You can find the First, Second, and Third Degree Modern Tracing Boards at Imagekind or at Fine Art America. Image copyright – Freemason Information ©2007-14, Greg Stewart, All rights reserved. Image above may not be copied without the expressed written consent of it’s owner, Gregory Stewart, Freemason Information.